Hammerworks Colonial Painted Wooden Chandelier, Model CH108 is a classic primitive style. This handcrafted Colonial Wooden Chandelier is an ideal choice to provide light over your dining room table. However, the compact dimensions make it a great option throughout your home. Consider placing this rustic chandelier in a bedroom, or maybe put a pair in the family room. 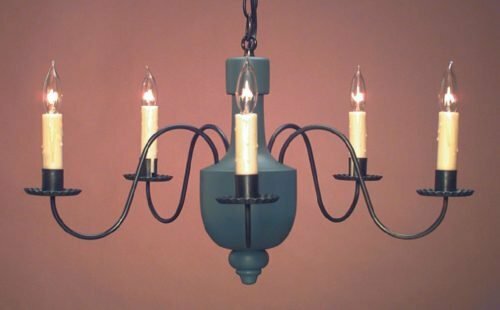 Most noteworthy, you have several options to choose from when you purchase an Antique Wooden Chandelier. Therefore, pick from assorted Old Village paint or hardwood stain colors. Of course, if you don’t see something you like, we can use any paint or stain color you wish to provide. In addition to a custom painted or stained finish, choose either antique tin or brass hand formed arms & ceiling canopy. 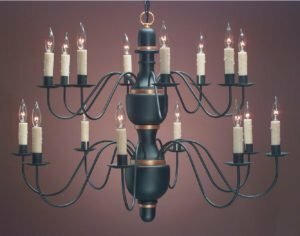 Another option to consider when designing your custom Antique Reproduction Wooden Chandelier, is how much chain you need to hang it with. Since we provide two feet of chain, you should determine whether or not that is enough. If not, you can order extra chain for a minimal charge. No matter what, once you make all of your choices, you will have a unique, custom chandelier for your home. Above all, since we create many styles of Colonial Wall Sconces, you are sure to find some to pair with any rustic style chandelier. With designs ranging from the simple Early American Brass Wall Sconce S101 to the imposing Williamsburg Primitive Wall Sconce S141, you’ll be able to make your selections easily. Take some time to surf the website to see our variety of offerings. As always, we offer several finish choices to coordinate nicely with your Country Wooden Chandelier. Consequently, in addition to antique tin or brass, we offer antique copper and painted black Early American wall sconces.